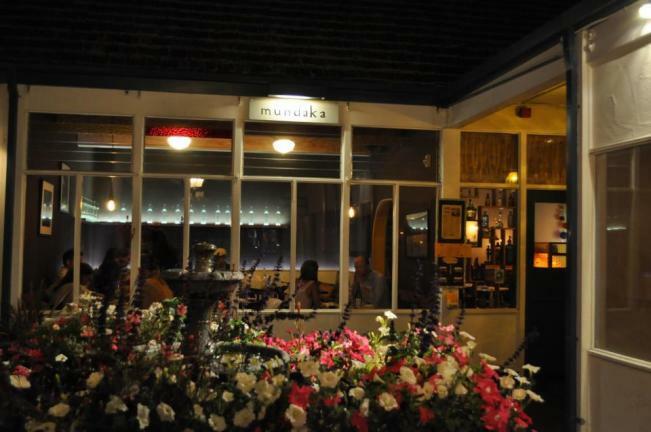 Tucked away in the Carmel Square Shopping Center, Mundaka opened in 2008, and this Spanish favorite is where Chef Brandon Miller is serving up some of the most delicious Tapas on the planet. 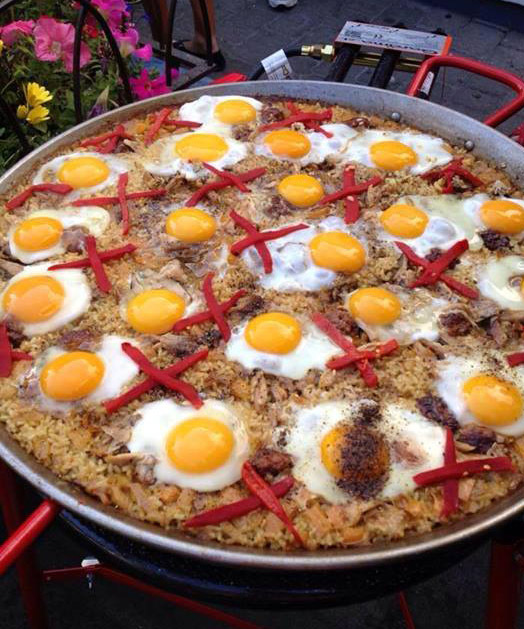 His renown for making authentic and delicious Paella brings patrons from far and wide to savor his culinary skill creating this traditional Spanish favorite. 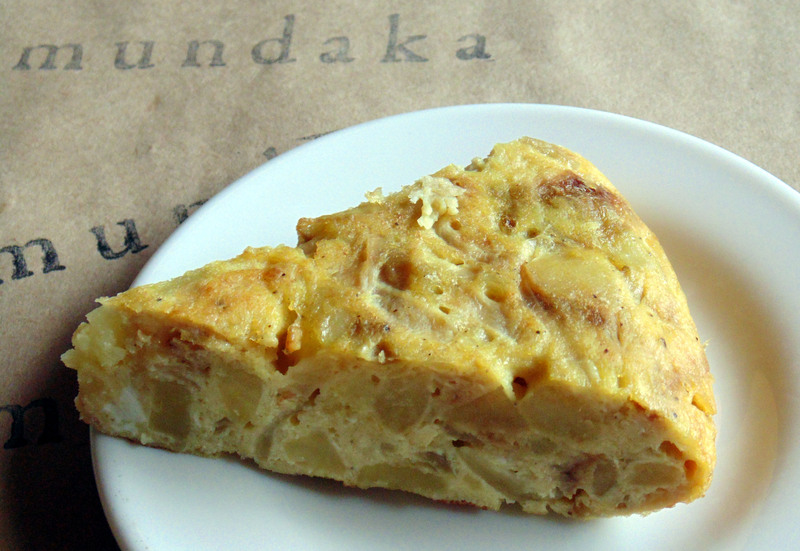 Tortilla with potato, egg, onion and sea salt is a great start. The beer battered fried squash blossoms with lavender carmel are flowers everyone should devour and delight in. 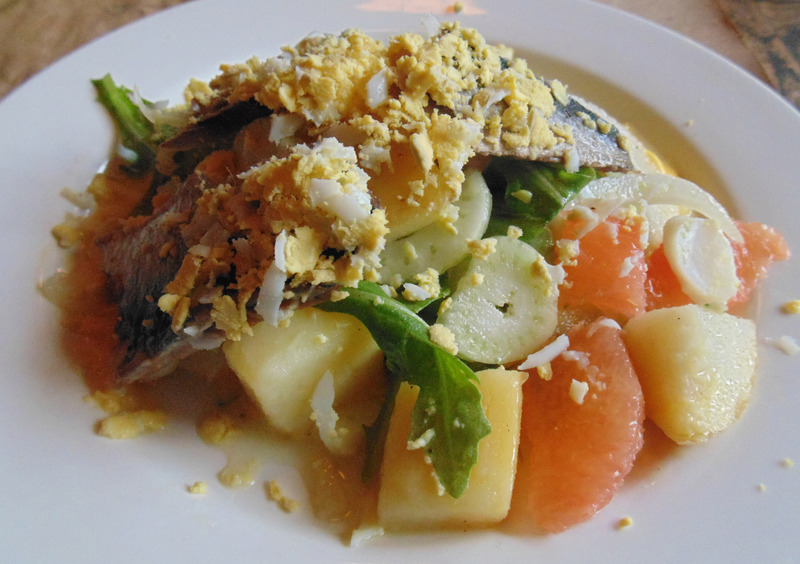 The house smoked sardines salad comes with poached baby potato, grapefruit, arugula, and saffron vinaigrette, delicious! 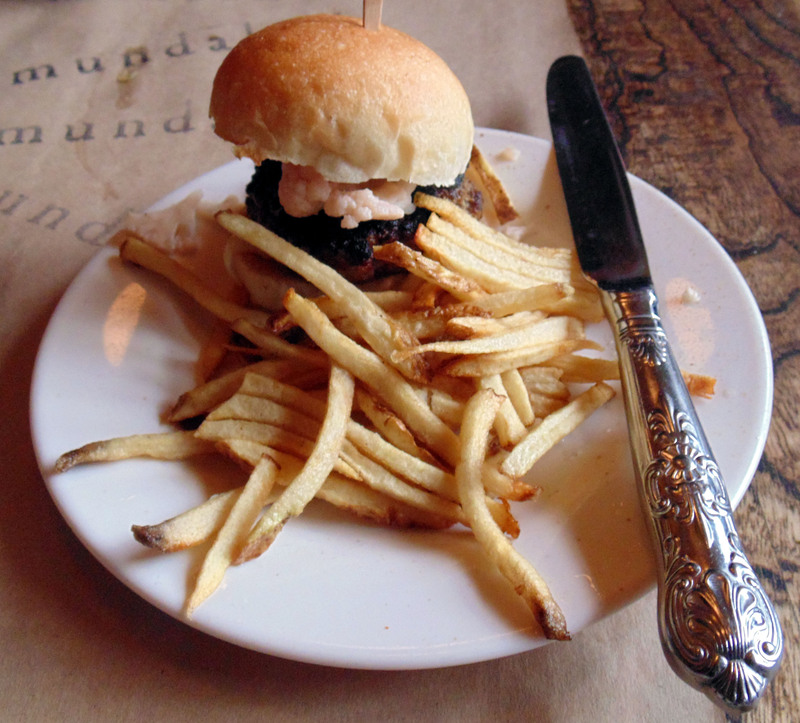 One of the most unique plates is the hamburguesa � mini lamb burger with pickles cauliflower and truffle fries. Another not to be missed plate is Albondigas � butifarro meatballs, and butter bean puree. Salads are all great here, and so are the desserts. If you want to eat a little or a whole lot they are so accommodating. The staff are helpful and rather handsome. These inventive plates by Chef Miller are enjoyed with cerveza, sangria, Porron Pequeno white and red wines, as well as home made lemonade and clever sparkling cocktails. 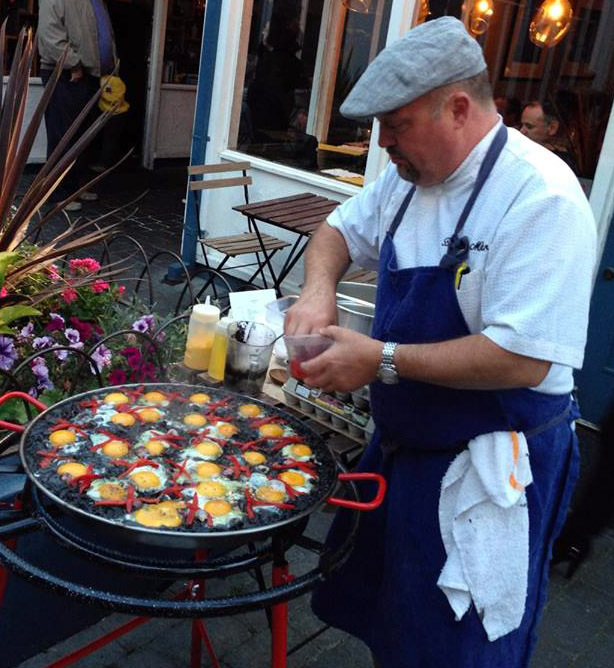 This venue has a reputation for being the center for everything tasty, fun, artistic, creative and cultural in the Carmel-by-the-sea. Make it a point to stop there on your next visit. The restaurant is located on the east side of San Carlos Street between Ocean Ave and 7th Avenue, between Nielson�s Market and Wells Fargo Bank. Look for the Blue and White awnings. In a 14� paella pan heat olive oil adding Chorizo, onions, bay leaf. Cook for a few minutes and add garlic and saffron. Cook until garlic begins to brown and add tomato paste, roasting it to remove any raw tomato flavor. Add tomato puree, chili flakes and smoked powder. Stir in rice and roast for a moment then add stock. Simmer over medium heat. Season seafood with salt and pepper and add according to how long each takes to cook. Total cooking time should be about 30 minutes. Add English peas with five minutes cooking time lest. Finish with extra virgin olive oil and serve. (Shellfish stock is a combination shellfish shells, saffron, garlic, tomato, sherry, fish stock and herbs). Gordon Ramsay will be taking his London restaurants to Asia with the announcement that Bread Street Kitchen will be opening in central Hong Kong in September followed by further restaurants in the area and across the region later in the year and in 2015. Operating as a consultancy and licensing arrangement, the Gordon Ramsay Group will be partnering with Dining Concepts in Hong Kong who specialise in the development of high quality experiences throughout the region. Bread Street Kitchen is one of 12 restaurants by the Group in London and the team will be working closely with their partners to ensure the quality of the brand and experience. The Group is also in final discussions with Las Vegas Sands regarding potential opportunities in Asia in Singapore and Macau. The Gordon Ramsay Group comprises the restaurant business of acclaimed chef, restaurateur, TV personality and author Gordon Ramsay. Run by Managing Director Stuart Gillies, it employs more than 700 people in the UK through its collection of 12 restaurants. The Group has a total of 24 restaurants globally and 7 Michelin stars, with international restaurants from Europe to the US and the Middle East. Originally routed in fine dining, the Group has expanded to include more casual fine dining sites offering a wide variety of guest experiences around the globe, such as Bread Street Kitchen, maze and Savoy Grill in London and Gordon Ramsay BurGR and Gordon Ramsay Pub & Grill in Las Vegas. 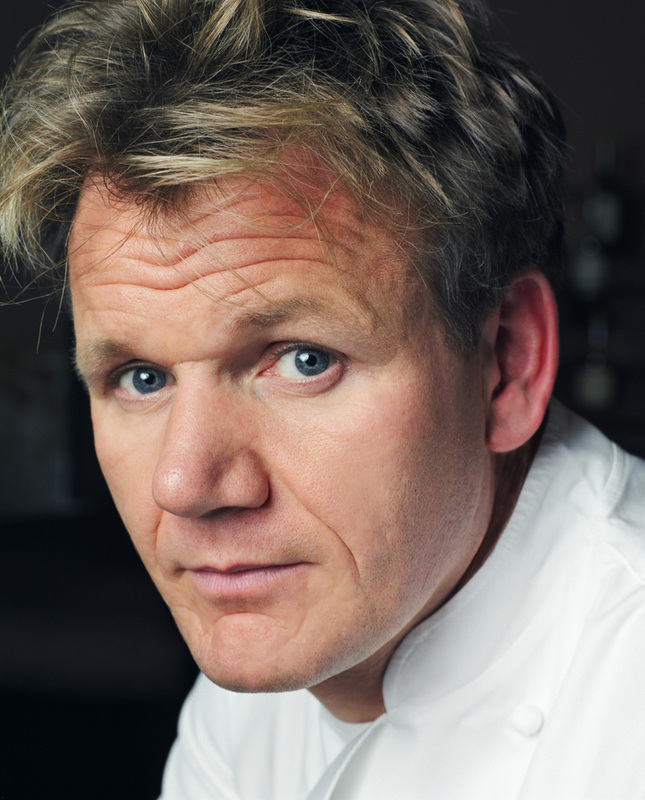 Restaurant Gordon Ramsay in Chelsea is the Group's flagship venue, which has held three Michelin-stars for more than 12 years. For more information, please visit www.gordonramsay.com. 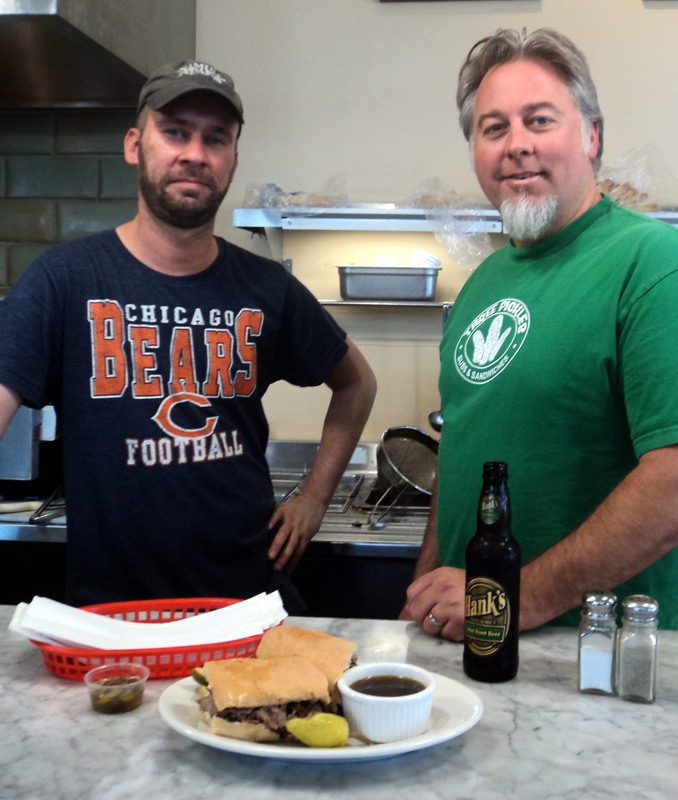 Clay Lovejoy, co-owner of Three Pickles, said it started on a visit to Chicago to visit his best friend�s girl who was in college there. This is where they discovered Al�s #1 Italian Beef Sandwiches, a mid-west favorite that later became the inspiration for their own Three Pickles version, served with three pickles. 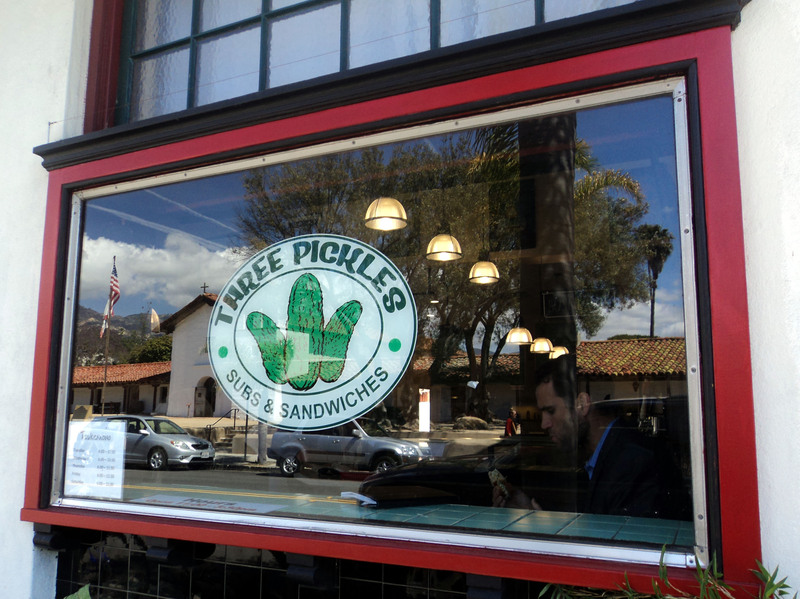 Visit: www.threepickles.com. PRESS, a modern, farm-driven steakhouse with an all-Napa wine list unrivaled by any restaurant in the world, has appointed Trevor Kunk as its new executive chef. Chef Kunk arrives to Napa Valley from the East Coast, where he spent the past seven years as chef de cuisine at Blue Hill New York, winner of 2013�s James Beard Award for Outstanding Restaurant. Chef Kunk aims to further refine the farm-driven steakhouse with an increased focus on local, sustainable produce, humanely raised meats, and responsibly sourced seafood, which dovetails with the restaurant�s existing partnerships with Rudd Farms, the Chef�s Garden at Edge Hill and renowned San Francisco butcher Bryan Flannery. In addition, PRESS recently completed an entire transformation of the restaurant�s 2,100 square-foot rear patio, offering diners a comfortable, relaxed outdoor dining experience perfectly timed to the arrival of summer. 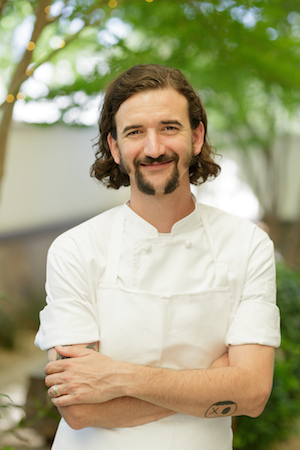 After graduating with an AOS in Culinary Arts from the Culinary Institute of America in Hyde Park in 2003, Chef Kunk went on to expand his culinary and pastry education at Charlie Palmer�s Aureole. In 2004, he transitioned to the famed Blue Hill New York where he worked closely with Dan Barber, working his way up from cook to sous chef and then finally on to chef de cuisine, a position he held from 2007 to 2014. Chef Kunk�s move to Napa Valley this spring, prompted in part by a desire for a friendlier year-round climate, is excellent timing for PRESS. Rudd Farms and the Chef�s Garden at Edge Hill, two Napa Valley farms that exist exclusively to support PRESS, Oakville Grocery, and Dean & Deluca, are ramping up production of sustainable produce and herbs, free-range eggs, heritage-breed pigs, and honey. PRESS was in need of a chef to take full advantage of the agricultural bounty, and given his extensive experience and wealth of knowledge, Chef Kunk is a natural fit. His commitment to the sustainable food movement and land stewardship is apparent in his encouragement of the entire kitchen staff to spend real time in the fields and cultivate individual relationships with the farmers. 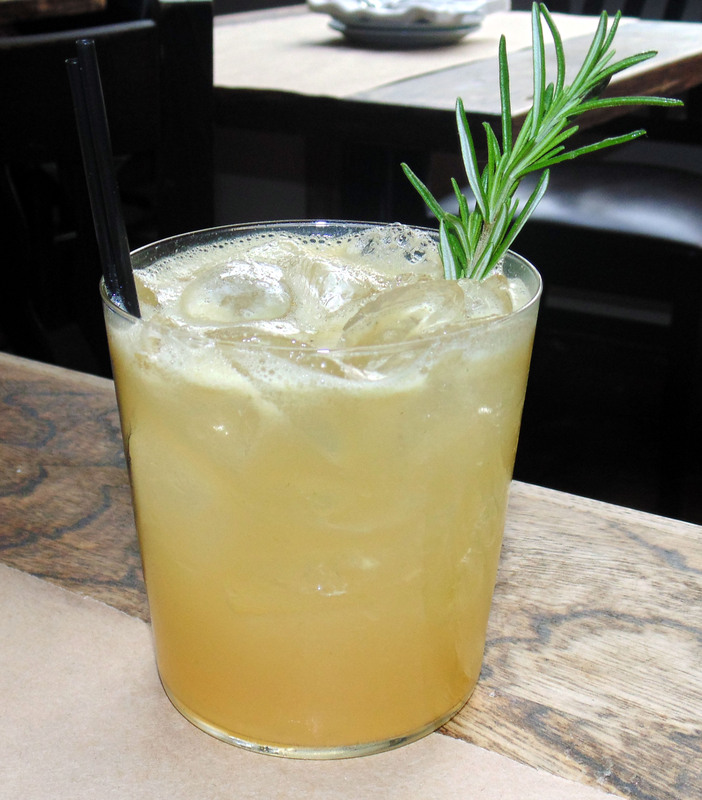 Chef Kunk plans on highlighting local and seasonal produce on the elegant yet approachable, steak-focused menu at PRESS. He is also excited about the tight-knit team already in place, from General Manager Spencer Weiss and Sommeliers Kelli White and Scott Brenner, to the kitchen and front-of-house staffs. The atmosphere in his kitchen is built on learning, teamwork, and incredible family meals, where the entire PRESS staff can come together to share in the bounty of the farms and the collective energy of the team. 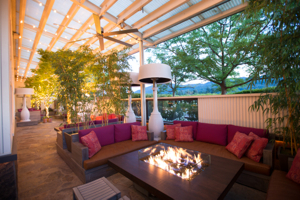 Just in time for summer, PRESS is also excited to announce the opening of its new outdoor patio, complete with built-in banquettes, a fireplace, firepits, and heated seating for up to 20 guests in the patio lounge and 20 guests for full dining. Both the bar and the dining room menus will be available on the family-friendly patio, making it an ideal location for cocktails and a bite from the bar or a multi-course romantic dining experience. The expansive and welcoming patio is also available for private parties, and can accommodate up to 12 seated guests in the private garden and 60 standing guests utilizing the entire patio. A true celebration of Napa Valley, PRESS is a modern, farm-driven steakhouse that features hyper-local produce and the finest sustainably raised meats, with an all-Napa Valley wine list unrivaled by any restaurant in the world. In addition to its vast, award-winning wine program, PRESS features produce from Rudd Farms and The Chefs� Gardens at Edge Hill, which exists solely to support PRESS, Oakville Grocery, and Dean & Deluca, along with humanely raised beef sourced from Bryan Flannery, sustainably caught seafood, and a fresh, innovative cocktail program. 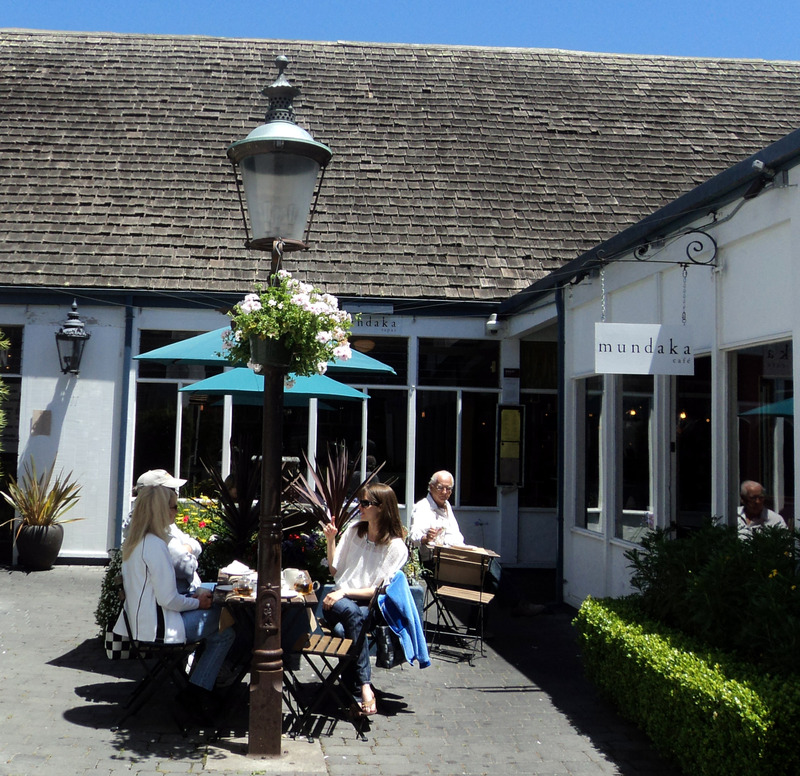 The elegant yet welcoming interior designed by Howard Backen complements and displays the surrounding Wine Country landscape, and the gracious, deeply knowledgeable staff is genuinely welcoming to locals and travellers alike. PRESS is located at 587 St. Helena Highway in St. Helena, Calif. The hours of operation are Wednesday through Monday, 5 p.m. to 10 p.m. To book a reservation, please call 707.967.0550 or visit opentable.com. For additional information, please visitwww.pressnapavalley.com. Use spices and herbs for seasonings instead of pre-made marinades/sauces which enables the cook to control sugar and sodium. Season freshly chopped veggies with seasonings of your choice and toss in a bit of olive oil. Then wrap the veggies into a foil pouch. Place pouch on top grill rack while meat is grilling and flip occasionally. This times your meat and your veggies to complete at the same time. Grill sliced pineapple and serve warm over Greek yogurt for dessert. Use leftover grilled veggies the next day on a salad or as a homemade pizza topper, or use them with your leftover grilled chicken or steak for fajitas.